Mangroves occur in South African estuaries at their southerly distribution limits, extending into temperate habitats. In 1963, William Macnae published the first comprehensive assessment of mangrove swamps in South Africa and made first-hand observations of these mangrove ecosystems. A critical review by Peer et al., “Latitudinal gradients and poleward expansion of mangrove ecosystems in South Africa: 50 years after Macnae’s first assessment,” published in African Journal of Marine Science ,Volume 40, Issue 2, reassesses South African mangrove habitats. This paper highlights changes since Macnae’s assessment, through a literature review of research done in the past 50 years and using the results of a dedicated mangrove survey spanning 2012–2017. For this review, 15 mangrove forests along the coast of South Africa were considered, with the aim of presenting a biogeographical overview. Data were collected over six years including a comprehensive survey between 2015 and 2016. Until now, changes have been recorded mostly for mangrove vegetation, including a change in mangrove cover and a poleward shift of mangrove species. While some mangrove-associated fauna have disappeared from most sites (e.g. 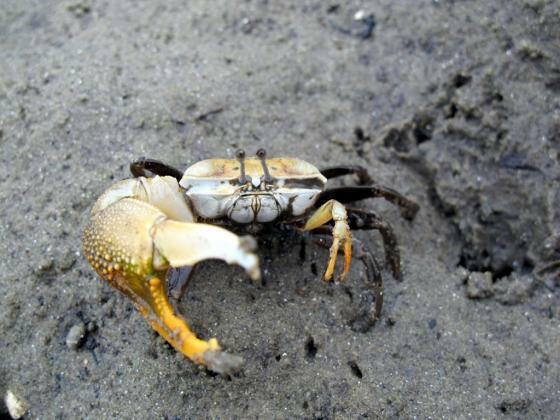 the gastropod Terebralia palustris), others, such as fiddler crabs, have spread farther south. The effects of decreasing diversity with an increase in latitude were not observed along the South African coast. Instead, habitat quality and estuarine mouth state seem to exert greater influence on species diversity in the mangroves, and a poleward shift in species distribution is now evident not just for the mangrove flora but for the fauna as well. The future research goals of the authors data and studies are to contribute to and inform management policies, especially concerning conservation and sustainable or alternative harvesting practices, on both a local and global scale. You can read this article at no cost until the end of August 2018 here.